Eybna Technologies is an Israel-based therapeutic cannabis research company utilizing an ethnobotanical approach to developing terpene-based formulas for medical applications. Cannabis is a highly complex plant; each strain possesses a unique chemotypic profile, and secondary metabolites, including terpenes, contribute to the overall effects of cannabis. Eybna studies cannabis phenotypes to develop complimentary secondary metabolite products enhancing therapeutic potential. The application of ethnobotanical principles with advanced analytical and scientific methods accelerates cannabis-based discovery – to the benefit of patients worldwide. Ethnobotany refers to a multidisciplinary, integrative approach to investigating the traditional relationship between regional or cultural populations and indigenous plants. This field of study incorporates ritual, mythology, and history, as well as medicinal indications and usage. Traditional botanical knowledge and customs provide valuable practical information about potential therapeutic applications of a given plant. How does Eybna apply the ethnobotanical approach? Eybna utilizes ethnobotany as an observational and analytical approach to medical cannabis usage data. This data is gathered, analyzed, and applied to complimentary product development. By observing and recording patterns in medical cannabis usage, Eybna is able to isolate and identify the popularity of specific strains according to indication. The secondary metabolites associated with these strains can then be isolated and formulated into complimentary products for use in conjunction with medical cannabis. These have the potential to enhance the therapeutic effects of medical cannabis. Are there benefits associated with conducting research and development in Israel? Eybna’s location in Israel proffers the unique benefit of a long-standing legal medical cannabis infrastructure. Since medical cannabis has been prescribed for a range of indications since the late 1990s, there are years of data from large cohorts of patients treated with pharmaceutical-grade cannabis. This environment lays fertile ground for significant research and industry potential. Since Israeli government regulation on cannabis research is very relaxed in comparison to Europe or North America, Eybna also benefits from partnerships with major Israel research institutes and licensed medical cannabis growers. What are some of these partnerships? Eybna has partnered with Seach, one of Israel’s first government licensed medical cannabis farms. With Eybna’s advanced data collection and analytic capabilities and Seach’s large database of patient medical cannabis usage, this partnership focuses on identifying consumption habits among Seach’s cohort of patients. Eybna effectuates this information in the creation of chemotype-specific complimentary products for use in conjunction with medical cannabis. 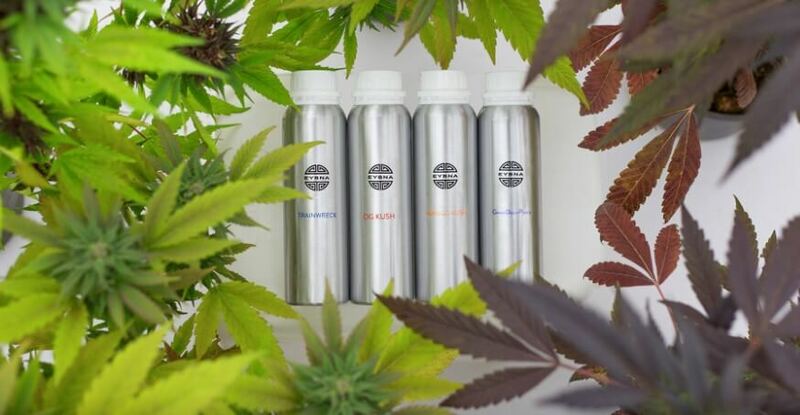 Steep Hill, a global leader in cannabis science, has joined Eybna in the development of terpene-based complimentary medical cannabis products. These formulations assemble cannabis-derived secondary metabolites to potentially enhance therapeutic applications. In particular, Eybna and Steep Hill are developing made-to-order terpene formulations that restore essential whole-flower properties to processed cannabis products including oil, liquid for vaporizers, tinctures, and ingestibles. Eybna is currently in a number of research partnerships investigating, isolating, and potentiating cannabis plant chemovars to target specific medical conditions. This includes working with Professor Zohar Kerem of the Hebrew University in studying non-cannabinoid cannabis molecules using tools from analytical chemistry, and an ongoing project investigating the effects of vaping terpenes as a stand-alone complimentary medical product. Does Eybna have any new partnerships or projects on the horizon? Eybna is very open to partnerships with analytics labs, research institutes, universities, and businesses. There is still so much to study and develop in this field, and the market potential is tremendous. There are currently several new research and industry partnerships in the works, including with several of Israel’s major university research institutes. Eybna is looking forward to announcing several new business partnerships in the near future.